Up to 500 jobs could be created after zinc deposits worth millions of pounds were discovered in the North Pennines, a mining firm has predicted. 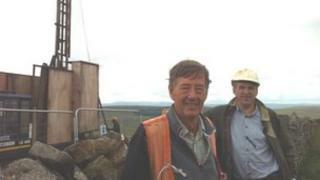 Canadian-based Minco has been allowed to test drill on the border of County Durham, Northumberland and Cumbria. The company says initial results are "very promising" and forecasts show up to one million tonnes of ore a year could eventually be extracted. The area has been mined since Roman times, primarily for lead. The company, which has already invested more than £500,000 in the operation, is concentrating efforts near Allenheads in Northumberland and Nenthead in Cumbria. So far, five 500m deep boreholes have been sunk. Minco's executive director Rowan Maule said the area could hold some of the largest zinc deposits in Europe. He said: "We believe that this could be a world-class deposit. "There is still a lot of work to do, which would involve a lot more drilling over several years, but the potential here is massive." "There could easily be, in five or six years from now, a major mine developed, should we be able to go through all the planning processes. "A project of that size would mean a mine producing a million tonnes a year and employing between 200 and 500 people." The company said its initial exploration programme in the North Pennines, which is an Area of Outstanding Natural Beauty (AONB), would last 12 months.